Could we have a sub-.500 division champion in the NBA this season? If you are an NBA fan, you probably noticed this morning that not one of the teams in the Atlantic Division has a winning record. The Toronto Raptors sit atop that division with a 5-7 record; they are the only team with a winning percentage over .400 in the division, and they are the only team that is in first place in their division with a wining percentage under .700. Chances are the winner of the Atlantic Division will not be a team with a sub-.500 record. But it does raise the question of what has been the worst winning percentage of a division winner in the NBA? Of these six teams above, four of them did not make it out of the first round of the playoffs in that season. 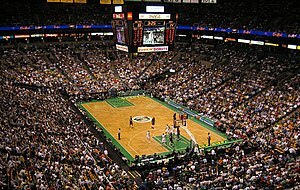 The 2005-06 Nets won their first round series that season but lost in the next round. The 2011-12 Celtics actually made it to the conference finals, but lost in that round in seven games to the eventual champions, the Miami Heat. Let’s flip it around a bit… how about the teams that had the best records of those that finished in last place in their division. This season, the New Orleans Pelicans are in last place in the Southwest Division with a 5-6 record (a winning percentage of .455) Note: Their last-place record would be good enough for first place in the Atlantic Division. Here are the last-place teams in a division that had the best records (since 2004-05).